Asem Hasna has come a long way in the last few years. 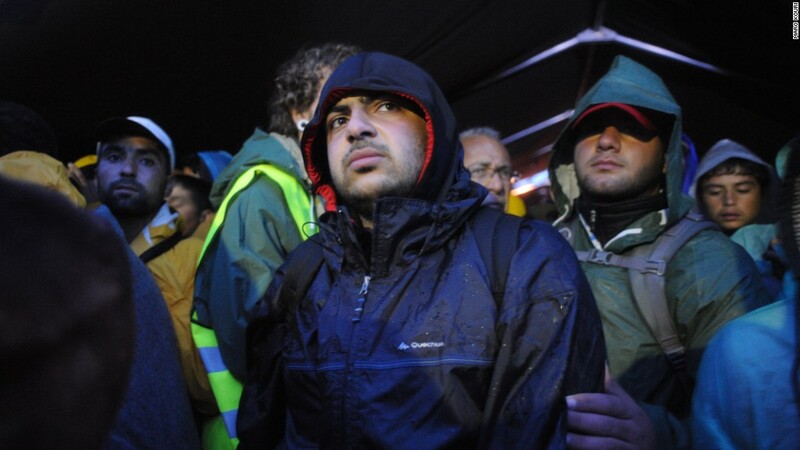 In 2012, he was a university student in war-torn Syria. Now, he's a a refugee in Berlin who's helping teach other young refugee students the technical skills of computer coding and robotics. Europe is dealing with the long-term consequences of the Syrian crisis. More than 1 million people migrated to the continent in 2015 alone. In the United States, President Donald Trump has framed refugees as potential threats, and he tried to temporarily ban Syrians from entering the country. But Hasna's story provides a different perspective -- one of opportunity. As people question what can be done to help those fleeing war, his journey provides a potential model, melding personal resolve with assistance from nonprofits and corporations. It started when Hasna lost part of his left leg in 2013. He says an artillery shell hit the ambulance he was driving in Syria. He traveled to Jordan to receive medical treatment, and it was there that he connected with Refugee Open Ware, a nonprofit committed to bringing advanced technological solutions to communities impacted by conflict. 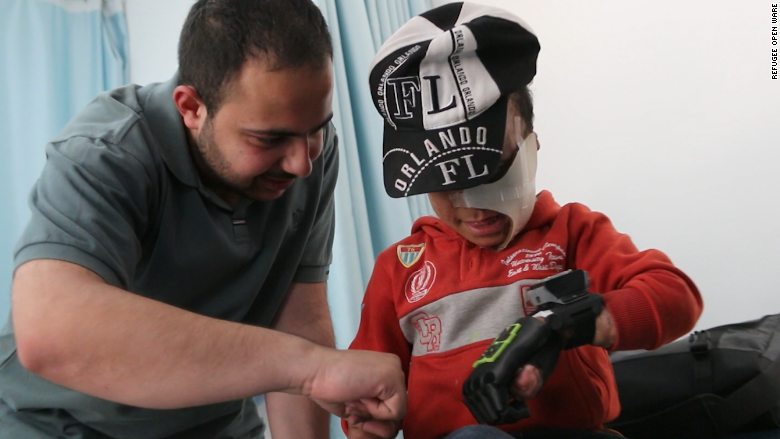 Hasna learned how to 3D print a replacement part for his prosthetic, an important tool in such a resource-strapped environment. "I could design this part and print it in less than two hours," Hasna says. "The original one costs $20 and this one costs $1. This is the idea about empowering people to learn about technologies." After a few years living in Jordan, where life was "not so easy, especially for Syrian refugees," Hasna emigrated to Germany with some of his friends. The journey was grueling -- especially since he had a partially self-made prosthetic leg. "The [trip] was something I can't forget for the whole of my life." He says he crossed through seven countries via bus, train, boat and by foot. Hasna in Deggendorf, Germany in October 2015 - his last stop before Berlin. Photographer Maro Kouri followed him during his journey. After about two weeks, he ended up in Berlin, where he started taking coding classes geared for refugees at the ReDl School of Digital Integration. "There's this period of time when they are not maybe legally entitled to do an official education or maybe to start working right away. So what we try to do is offer an alternative," says Mireia Nadal Chiva, who is the Head of Community Development at ReDI. "Very hands-on, practical training that they can do in this time when they couldn't be doing much." ReDI is a nonprofit with two main goals: To provide a community for newcomers to Berlin, and to train refugees to help fill the thousands of IT job openings in Germany. After two months in a class focused on the Raspberry Pi and Arduino platforms, Hasna was connected with Cisco (CSCO), which offered him an internship. He's currently working out of the openBerlin Innovation Center and hopes to pursue a career collecting data from connected devices. "He was self sufficient and motivated. We want to have these kinds of people," says Andre Diener, a Cisco exec who is acting as Hasna's mentor. "If we have innovative solutions here, and we have innovative people here, like Asem, we want to scale them as well to other countries around the world. That's an opportunity for all of us." Hasna instructs two teenage refugees from Syria in Berlin. Hasna was granted official asylum in Germany in November. In his spare time, he's teaching weekly robotic workshops with refugee youth through ReDI. And he still uses his prosthetic with that 3D printed replacement part. "I really would like to motivate kids to start learning about this," he says. "The lifetime is not always enough to learn everything you need. The earlier you start, the best outcome you can get." -- Nadine Schmidt contributed to this report.